Today I got a chance to preview a new tool for the Czur scanner, a TWAIN32 driver with vendor capture and control panel.. and its awesome! The user interface is slim and light "minimal" like a scanner configuration dialog is supposed to be -- it very much proves the maxim "Less is More" so incredibly much more. It is still in development and as provided to me still had its Chinese UI glyphs, but I pulled out my Google Nexus 5x and used the Google Translate App (which is based on acquired technology for augmented reality "LENS") and aimed it at the UI and was instantly provided an English UI. Its both a blessing and a curse to use a TWAIN32 driver and UI panel on Windows 7x64 but I'm so familar with TWAIN it felt like an old friend. First I won't post any photos, pics or images until Wiston approves it out of respect. -- its really not a lot to look at, but seeing it work is simply "Amazing". Second TWAIN is not an "application" but its more than just a driver. 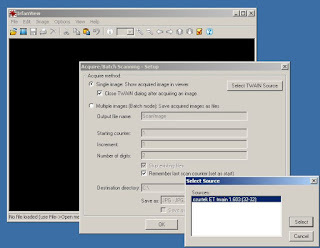 It provides a standardized way to open a still image capture session with a dedicated scanning tool and provides a means to expose vendor specific controls for configuring the tool to acquire the highest and most refined image captures the device can provide. It can be dumbed down using the Windows Image Acquisition (WIA) generic interface to just "aim and fire" taking a snapshot for recording images of paperwork like checks and receipts.. or it can [open] the Scanners full vendor provided [dialog panel] with all kinds of configuration controls. Czur has provided a [complete] driver and vendor dialog panel, so you can "get your cake" and "eat it too". Vendors in the name of expediency and economics rarely do both.. and usually barely meet the minimal requirements for releasing a driver that qualifies as a TWAIN driver.. more often they release a WIA or Windows driver and leave it at that. Czurtek did not do this.. they went all the way. Understand this is a Windows only TWAIN driver.. while I would love to see a Mac TWAIN driver and preview that too.. I have not. And I have not seen a TWAIN or SANE driver for Linux. This blog post is strictly about the Windows TWAIN32 driver. Microsoft has had a love hate, apathy relationship with TWAIN, first competing with it to try and control the standard, then introducing their own (WIA) and finally deprecating and wrapping DirectShow and Media Foundation to provide "similar" functionality as a movie capture and gaming play format. The end result is TWAIN on windows often comes through a WIA to TWAIN "bridge" that translates Windows application calls into TWAIN calls through a software bridge.. unless the Windows Application is aware and supports "direct" TWAIN device driver support.. and if it does often will "open" the TWAIN device dialog for fine tuning the capture session. subdirectory.. with a data source file and an uninstall program to remove it. It appears like any other installed application in the Control Panel Programs and Features menu. TWAIN drivers and apps are service providers and are not required and generally do not come with standalone applications. So you need to use the driver and dialog box by setting up your preferred application for handling the image acquistion, by configuring it to either use the WIA to TWAIN bridge built into Windows.. or using an application aware of and capable of using the TWAIN driver directly. Irfanview will do both.. though I used it for TWAIN. Basically in the mode I used Irfanview, it launched the vendor TWAIN dialog panel and I made all of my fine tuning and captures from there. Once it was setup I also discovered the usual [snapshot] switches on the base of the Czur scanner would also initate a capture and upload the image to the PC. -- the upload speed was about the same as with the Full Desktop Suite of software that originally came with the Czur software. It is still constrained by the limits of the USB 2.0 bus. And it still caches rapid fire images captured on the scanner and uploads them as time and speed allows to the PC. I won't say much about configuring Irfanview to use TWAIN except that be aware that there are TWAIN32 and TWAIN64 drivers. And on Windows -- 32 bit applications can "see" and "use" 32 bit TWAIN drivers [only] and Windows 64 bit applications can "see" and "use" 64 bit TWAIN drivers [only].. in other areas Microsoft has built "cross bit divide" bridges.. but its very hard and they did not for TWAIN ! -- so be sure the Irfanview you use with TWAIN32 drivers is Irfanview32 [Not] Irfanview64 -- and Irfanview once installed does not expose or tell you which version (32 or 64 bit) it is from the usual Windows About menu. The symptom that will be noticable if you install the TWAIN32 driver and then Irfanview64 is when you open the Acquire menu in Irfanview and attempt to select a scanner.. the czur scanner will not be listed as an available TWAIN source. If you then install and run Irfanview32 the czur scanner will appear in the list of available TWAIN sources. As the User Interface is currently laid out there is a navigation panel on the left of configuration options and a large [Preview] window to the right. In case your "wondering" an uncompressed bmp format of one image 4608 x 3456 pixels is a 45.5 MB file, the pixels are not artifacted or aliased and blur only upon Zoom factor 2000% or more. So .. yeah.. its a Big deal. This level of control is [much improved] over the original software defaults. It has a few stability issues, which could be "user" misunderstandings about affirmatively completing a selection change.. it is not released software, so this could vastly improve.. but its very usable the way it is right now. There are so many usability "improvements" over the original "presets" and "simplified" workflow of the original software its hard to know where to begin to describe them -- but at the same time, the potential to completely mess things up is completely in the hands of the end user. Choosing resolutions, dpi settings, media type, whether to depend on autocrop to resize margins. Are all within your control, and making the correct and consistent selections are also your responsibility. Exposure is not [digital] it is an [analog] slider control, you have far more fine grained control to subtly light the scene from complete darkness to "much" brighter than that perceived by human eyesight alone. Or there is a checkbox to engage [autoexposure]. The image filename dialog is slightly more than just set a static name, it allows "composing" an automatically incremented filename "template" which is used to store subsequent images either captured by clicking the dialog [Scan] button.. or as a result of pressing the [Snapshot] button on the czur scanner base pedestal.. and its assumed similar with the USB hand switch or foot pedal.. or any other sophisticated USB attached trigger device. In summary -- I've had very little time to run through all the features, but what I did is solid and works. It is not perfect, but its also not released and still in development.. but there are no "show stoppers".. it a very capable and enabling piece of software. And since it is TWAIN standards compliant any Adobe, or Pagemaker or Image management software that understands TWAIN is immediately capable of using this driver as its native front end for acquiring and capturing source images to feed a workflow. TWAIN is a stable and well thought out standard, its very large and encompassing and cross platform, it places the burden of development on the hardware vendors to best represent their hardware product in its best light under it highest performing conditions. To a degree USB or memory based transfer protocols like PTP or MTP have replaced capture and transfer between a camera device and a PC.. but those really do not address high resolutions or "performance" of the capture device.. leaving much up to lowest common denominator standards on all fronts.. and often ending up in disappointing results. Many document processing software toolkits are steering towards blurry mediocre image capture libraries suitable for uploading to the cloud.. and really are not suited to archival document rentention tasks. Czur scanner and its TWAIN32 support heads back against that tide and brings a really high potential product to the market. [Almost forgot] : One of the reasons to use Irfanview as a host for the TWAIN driver and dialog is that Irfanview can also be called from the cmd line to capture from a twain source.. meaning this is one path to a cmd line tool which can be scheduled or "scripted" from within the windows operating system with minimal experience and effort on that part of the end user.